Me in Santa Teresa County Park, at the interpretive sign on Coyote Peak, 12/6/16. I took most of the pictures, including the panorama, and helped with the sign's design. Welcome! My favorite hobbies and activities are photography, hiking, biking, computers, geocaching, travel, and travel writing. I've created a number of Web pages on travel and recreation in the San Francisco Bay Area and California. 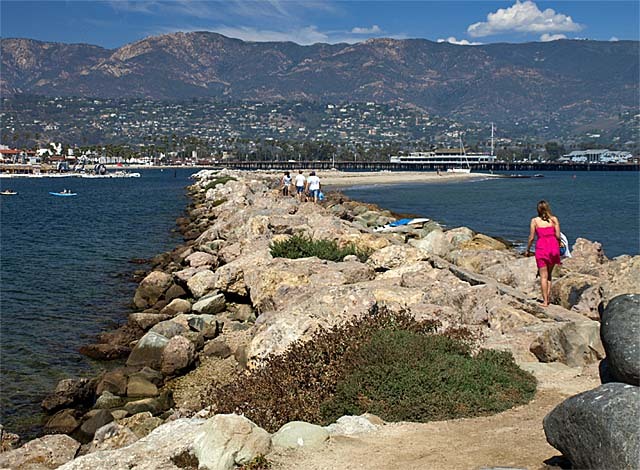 Here you will find links to pages with photos and information on parks, beaches, trails, history, and places to visit. I'm a retired electrical engineer. I spent over 34 years in the computer disk drive industry, working for IBM, Hitachi, and Western Digital. Among other activities, I am a volunteer photographer and docent for the Santa Clara County Parks & Recreation Department, a docent for the Open Space Authority of Santa Clara Valley, and a member of several volunteer and non-profit organizations. Note that this is entirely a volunteer effort, with no commercial intent or sponsorship. These pages are for information only and are based on my opinions, research, and observations. 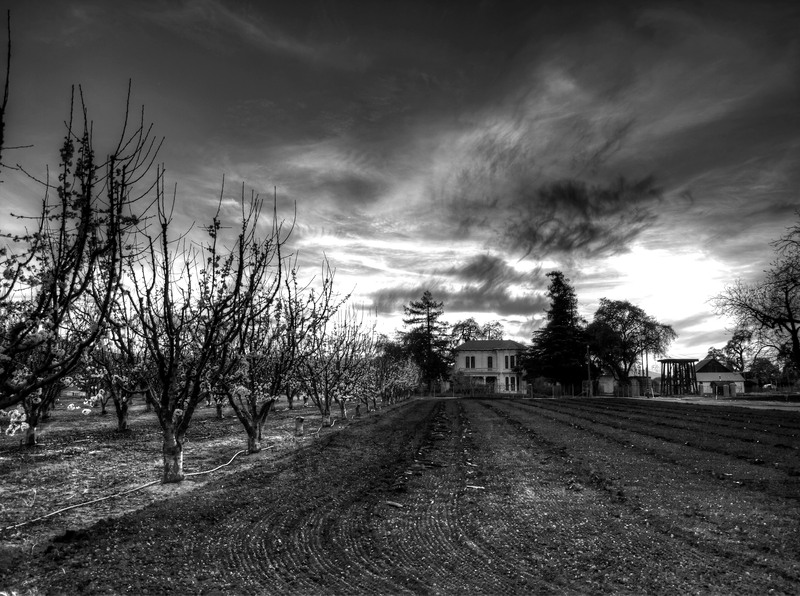 My picture of the Casa Grande in Almaden Quicksilver took first place in the non-professional category of the VisualSJ photo contest. See the Awards section below. My pictures have been used for some of the County Parks' "Nature is Nearby" Billboards. I taught my annual outdoor photography class at the Bernal-Gulnac-Joice Ranch in Santa Teresa County Park on Saturday November 14 at 10 am - 1 pm. "Join a Docent for a FREE outdoor photography workshop. Learn how to choose and use a camera, how to take better outdoor pictures, and about photo composition. Workshop begins with an indoor slideshow, followed by demonstrations and a walk around the historic area to take pictures. Meet at the Bernal Ranch barn, 372 Manila Dr., San Jose." Here are pictures from the class. Some of my pictures of the Santa Clara County Parks were used in an episode of the Open Road TV show on NBC Bay Area. See the video on the Parks for Life Challenge, starting at 5:41 to 6:05. April 16 at 10:00 am on Bernal Hill, starting at the Bernal-Gulnac-Joice Ranch on Manila Drive. April 30 on the Stile Ranch, Mine, and Fortini trails, starting at the Fortini/Stil Ranch Trailhead on San Vicente Avenue off Fortini Road at 9:00 am. I gave my outdoor photography class and hike at Coyote Lake/Harvey Bear Ranch County Park on May 7, 2016 at 10:00. Here's a poster for the class/hike. Measure A was on the June 2016 ballot. It renewed the Park Charter Fund, which allocates a fixed percentage of Santa Clara County's budget to fund the County Parks. It is not a tax, but an earmark that guarantees that the parks will get their fair share of the budget. It provides a reliable source of funding (though not a fixed dollar amount) for the County Parks, which allows them to maintain a high-quality park system and do long-term planning. The ballot measure also increases the percentage of the fund allocated for park development to allow them to do park improvements and open new parkland. My pictures were used as part of the "Yes on A" campaign. Measure A passed with about 78% yes votes. It only needed just over 50%. "Nature Photography for Beginners, Saturday, July 23, 2016, 4:00 - 7:00 p.m, Coyote Valley Open Space Preserve. Join nature photographer Ron Horii for this fascinating and engaging learning experience. Bring your own camera, phone, tablet or whatever you like to take pictures with and Ron will take you on a walk to observe nature as a photographer would. Learn how to take more engaging pictures from someone who is a passionate nature and community photographer." I previously gave this class on June 11, 2016. Here are some pictures from it, mostly taken by my son Chris. I gave another class for the Open Space Authority at Ulistac Natural Area in Santa Clara on Saturday, August 20, 2016 at 4:00 pm. Here are pictures from the class, mostly taken by my son Chris. I gave an outdoor photography class at Santa Teresa County Park, on November 12, 2016 at the Bernal-Gulnac-Joice Ranch. Here's a flyer for the class. The Open Space Authority of Santa Clara Valley has an article about me in their Spring 2017 newsletter (see page 2). My pictures have been used in a billboard and busback advertising campaign for the Santa Clara County Parks, called "Wish You Were Here?" I edited and wrote many of the articles for the Friends of Santa Teresa Park's Summer 2017 newsletter. The Friends of Santa Teresa Park held a National Night Out event at the Bernal Ranch on Tuesday, August 1, 2017, from 5-7:30 pm: Free ice cream and cookies. Bring your family to our fun event. Meet your neighbors and public safety officials. Speak with local and county representatives. Fire engines, park ranger trucks, sheriff and police patrol cars, and other emergency vehicles on display. Children’s crafts project and games will be provided. Sponsored by: The Friends of Santa Teresa Park, Santa Clara County Parks and Recreation, United Neighborhoods of Santa Clara County, City of San Jose’s Community Action and Pride Grant Program. Emergency agencies vehicles and public officials will attend depending on their schedule. Here are pictures from that event. Family Fandango was held this year on Saturday, August 5 from 5-8pm at the Bernal Ranch in Santa Teresa County Park. ​Celebrate the history of early California and its ties to the Anza Expedition and the Bernal family. The evening’s focus is family fun through song, dance, demonstrations and activities that highlight the many contributions of our early communities. Location is Camino Verde at Manila Drive in San Jose. Here are pictures from that event. I gave a lunchtime brownbag slideshow presentation on outdoor and nature photography at the Open Space Authority of Santa Clara Valley's headquarters at 33 Las Colinas Lane, San Jose, on September 22, 2017 at 12:30-1:30 pm. More information here. I gave an outdoor photography class scheduled at Santa Teresa County Park on September 30, 2017 at the Bernal-Gulnac-Joice Ranch (Manila Drive at Camino Verde) from 11am to 2pm. Here is the flyer for the class. You can register online here or call (408) 355-2201 to register or for more information. I gave a Nature Photography Workshop at the Japanese Friendship Gardens, 1300 Senter Road San Jose, CA 95112 on Saturday October 21, 2017 from 4pm to 6pm. See here for more information. Sunday 3/25/18: “Hike the Magnificent Seven! Santa Teresa” 10am to 1pm. 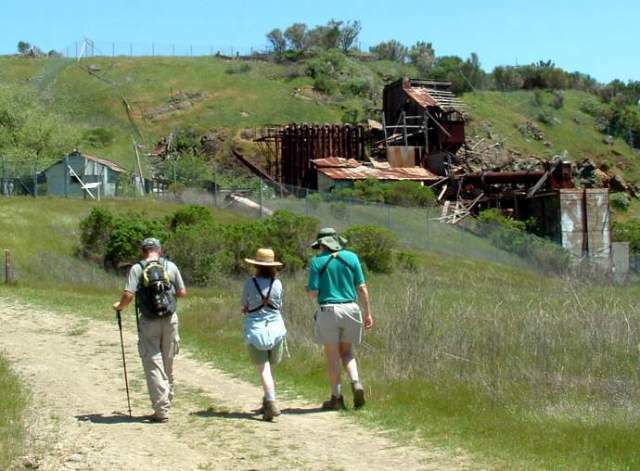 Join the Friends of Santa Teresa Park for a moderate 2.5-mile #PixInParks hike on the Stile Ranch, Mine, and Fortini Trails. View spectacular wildflower displays, take in the gorgeous views, and hear talks about the rich history of the area. There will be nature and history exhibits and activities at the trailhead. Please bring snack, sunscreen, water and wear comfortable shoes. Meet at the Stile Ranch Trailhead on San Vicente Avenue, at the end of Fortini Road, off McKean Road. Here are pictures from that event. Saturday 3/31/18: Outdoor Photography and Wildflower Walk: 10 am - 1 pm. Join a docent (me) for an outdoor photography class and slide show in the barn at the historic Bernal Ranch followed by a moderate, but easy-paced hike up the Joice Trail to take pictures of the colorful spring wildflower displays. Meet at the Barn with your camera or smartphone. Register here. Here are pictures from that hike. Saturday 4/21/18: Coyote Peak Vistas Hike: 2 pm - 4 pm. Join the Friends of Santa Teresa Park on a moderate 2-mile hike to Coyote Peak starting from the Pueblo Day Use Area. Look at the wildflowers and trees along the way. At the top, take in panoramic views of the Bay Area and Coyote Valley. Please bring snack, sunscreen, water and wear comfortable shoes. Register here. Here is a flyer I made for this hike. Santa Clara County Supervisor Dave Cortese's office contacted me last year about providing a picture that would be used on the Gold Star Families Memorial monument to be installed in Oak Hill Memorial Park. It honors families of fallen military members. I sent them some pictures, and they chose one that I took from the Bernal Hill Trail in Santa Teresa Park on 4/15/16. The picture was etched in granite on the back of the monument, representing the homeland of the families, in this case, Santa Clara County. Here is an album of the ceremony and the monument, which was dedicated on 4/14/18. On Sunday, September 23, 2018, the Friends of Santa Teresa Park had an information booth at Viva CalleSJ. I helped setup the booth, and my pictures were on display. Here are pictures from that part of the event. This is a huge annual event. Several miles of San Jose streets are closed to vehicles, so bicycles and pedestrians can experience exploring those streets without having to worry about traffic. There were lots of activities along the way. On Sunday, September 30, 2018, from 10 am-1pm, I gave an outdoor photography class at Santa Teresa County Park's Bernal-Gulnac-Joice Ranch. Here is a flyer for the class. On Wednesday, October 10, 2018, I led a hike to Little Uvas Creek Open Space Preserve in Morgan Hill for the City of Morgan Hill's El Toro Social Club for seniors. Here are pictures from the hike. On Sunday, October 14, 2018, I helped to lead a hike for the Open Space Authority in San Jose's Alum Rock Park. Here are pictures from that hike. On Saturday, October 27, 2018, I helped with the La Fuente event at Santa Teresa County Park. Here is the description: "Bernal Ranch is "La Fuente" or "The Origin" for family histories, local economy, and a growing new community. Join us to celebrate the different histories of "Santa Teresa Spring," the original source of thriving communities from the past to present day. The afternoon event will feature cultural presentation of local community organizations, family activities, and children's games. FREE and fun for all ages! Questions? (408) 226-5453​." Here are pictures from that event. On Sunday, November 25, 2018, I helped with a plant identification hike at Rancho Canada del Oro Open Space Preserve. 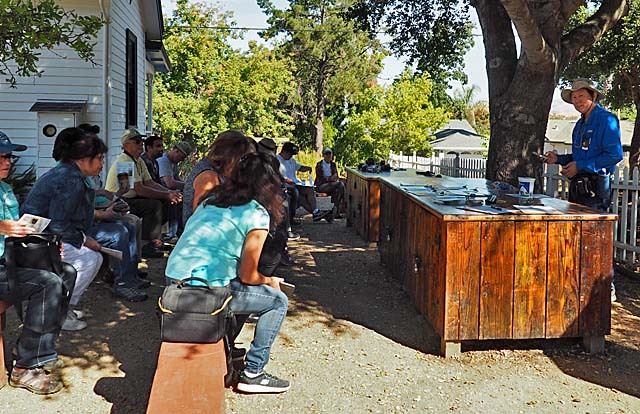 On Wednesday, December 12, 2018, from 10 am to 12 pm, I taught an outdoor photography class at the Morgan Hill Community Center for the City of Morgan Hill's El Toro Social Club. This was the description: "Picture Perfect Outdoor Photography: Whether you're a newbie or an experienced photographer, this class will help you take better pictures! Photographer Ron Horii, will share secrets of outdoor photography. He'll show you how to get the most out of your camera and how to choose photo composition, lighting, editing, advanced tricks, and posting pictures online. He'll show local hotspots for taking beautiful pictures of nature or as backgrounds for portraits of your family and friends." On Friday 12/7/18, I went on the first public presentation and guided tour on the History of Almaden Air Force Station on Mt Umunhum. 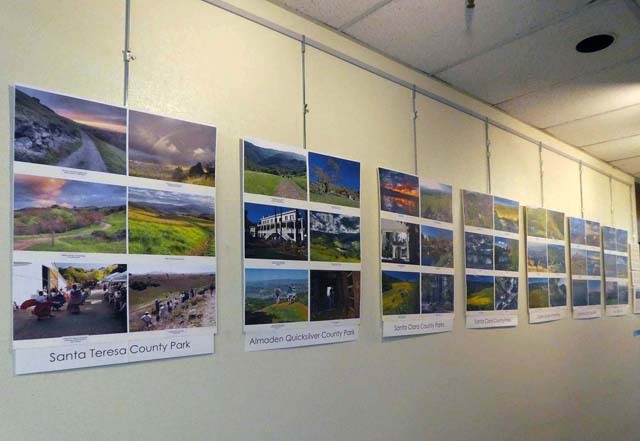 From 2/1/19 to 2/28/19, I have a photo exhbition of the parks and preserves of Santa Clara County at the Campbell Library in downtown Campbell. Here is an album showing the exhibition. Join us for a hike at Rancho Canada Del Oro Open Space, a park whose serpentine soils make for awesome displays of wildflowers. This 3882-acre preserve is managed by the Santa Clara County Open Space Authority. It is located in the foothills of the Santa Cruz Mountains. While walking over rolling hills, wildflowers on display include yellow Johnny jump-ups and fiddlenecks, orange California Poppies, purple Lupine and vetch, Blue eyed grass and blue witch, white milk maids and star lilies and more! Along the way, we will learn about the complex ways climate change affects the natural resources we depend upon. Everyone will get a wildflower guide to help them identify wildflowers along the hike route. We end the day with a social picnic lunch. I am giving another outdoor photography class and wildlflower hike in Santa Teresa Park, meeting at the Bernal-Gulnac-Joice Ranch on Saturday April 27 from 10 am to 1 pm. "Join a Docent for a FREE outdoor photography workshop. Learn how to choose and use a camera, how to take better outdoor pictures and about photo composition. Workshop begins with an indoor slideshow, followed by demonstrations and a walk around the ranch. Meet at benches near the Ranch House with your camera. Reservations online​ or call 408-355-2201." Here is the flyer for the class. 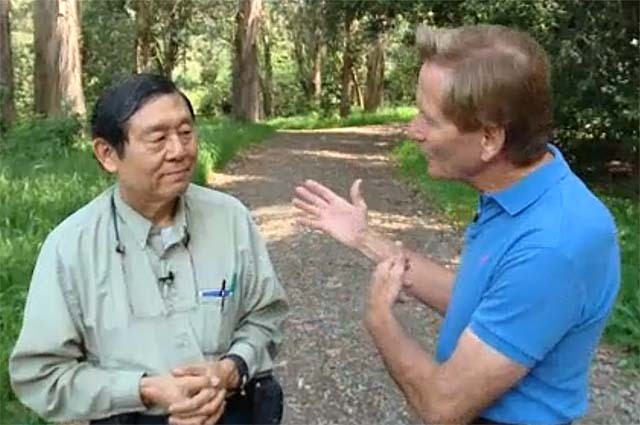 Join docent Ron Horii as he takes us on a tour of Coyote Valley Open Space Preserve.. Discover and explore this beautiful preserve with a knowledgeable docent who will talk about the plants and wildlife found here. The hike will be 4 miles long and moderately strenuous with several uphill grades. Along the hike, you will see oak woodlands as well as grasslands. The trail may be muddy, rocky and uneven in some areas, so sturdy shoes are advised. Bring water, lunch or snack, a camera, sunscreen, a hat and your sense of adventure! There are restrooms in the parking lot but none on the trail. 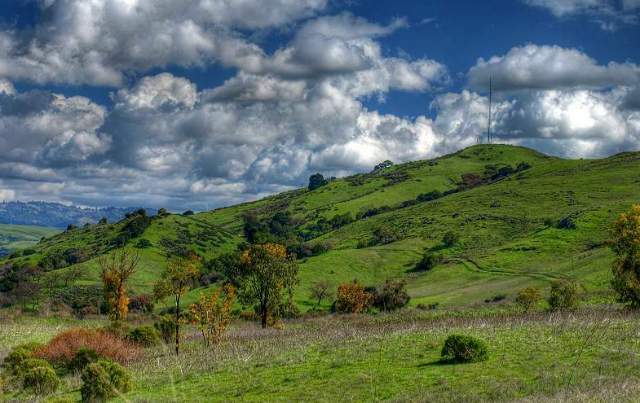 This is a hike I will be leading with the Friends of Santa Teresa Park on Saturday May 11, 2019 from 10 am to 1 pm, meeting at the Stile Ranch/Fortini Tralhead on San Vicente Avenue in the Almaden Valley: "Join the Friends of Santa Teresa Park for a moderate 2.5-mile hike on the Stile Ranch, Mine and Fortini Trails. View spectacular wildflower displays, take in the gorgeous views, and learn about the rich history of the area. Meet at the Stile Ranch Trailhead with sturdy shoes, snacks and water. Questions? (408) 355-2240​." The Stile Ranch Trailhead is off of McKean Road. Take Fortini Road and turn left on San Vicente Avenue to the parking lot. (Migrated from geocities.com/santateresapark.) 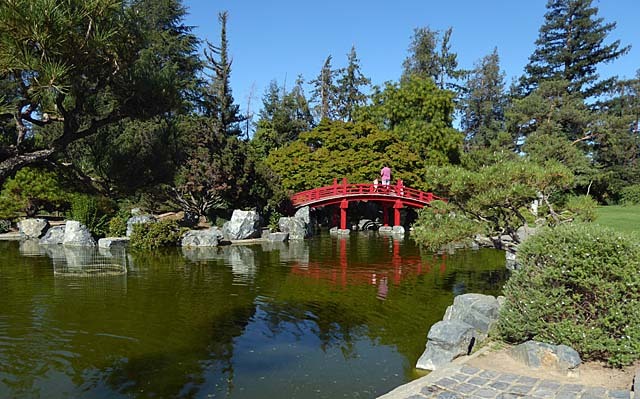 Here are web pages on my favorite park in San Jose. The park covers nearly 1700 acres in the rolling, grass-covered hills guarding the southern gateway to the Silicon Valley. It's the closest County Park to where I live, so I go there the most often and have lots of pictures of it. Facebook: SJ Fire Dept. Training at the Pueblo Area, 1/19/18 (on STPFriends Facebook page). (Migrated from geocities.com/stpfriends.) The Friends of Santa Teresa Park (FOSTP) is the volunteer organization supporting Santa Teresa County Park. I am the secretary and webmaster for the organization. Find out what's going on in the park and what you can do to help make it better. This site is updated frequently with park and community news, developments, pictures, and volunteer activities. Below are Santa Teresa Park-related volunteer events and community issues. The Friends of Santa Teresa Park also has a Facebook page, STPFriends, which I help administer. Pictures from Ranch Spirit Day, 8/25/07. Pictures from the trail workday on the Norred Trail, 3/13/10. Geocaching in Santa Teresa Park - Geocaching is a hobby and recreational activity that has been growing in popularity. It involves using GPS (Global Positioning System) receivers to locate hidden "caches" whose GPS coordinates are published on the Internet. Santa Teresa Park is a popular place for geocaching. (Migrated from geocities.com/almadenqs.) Website on one of the Bay Area's crown jewels. 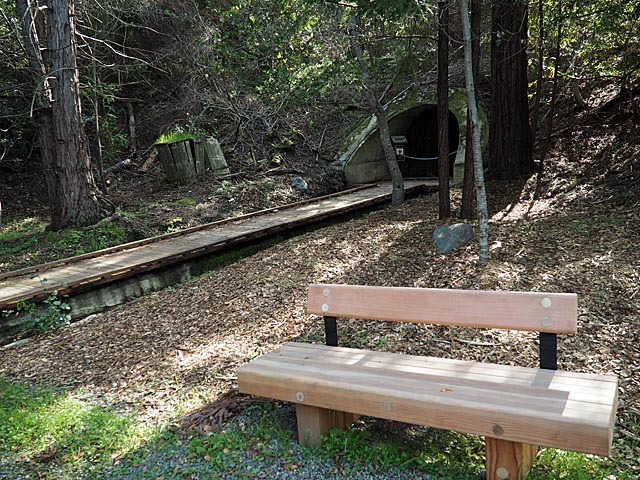 This park, in the backyard of the Silicon Valley, covers almost 4000 acres, with hiking trails through rugged, wildflower-covered hills filled with historical quicksilver mining relics. Pioneer Day in Spanishtown, 10/14/06. Instructions for slideshows: move mouse around the bottom of the page to see the controls to pause/play and step back/forward. Slideshow will loop. To stop, right-click, choose Exit option. The Santa Teresa Hills and the Coyote Alamitos-Canal - (Migrated from geocities.com/santateresahills.) Pictures and descriptions of the Santa Teresa Hills in South San Jose and the Coyote Alamitos-Canal which runs below them. * Note that the Open Space Authority provides 20% of its capital expenditures to fund urban open space projects. This includes the Albertson Parkway, Martial Cottle Park, the Three Creeks Trail, the Coyote Creek Trail in Selma Olinder Park, the Penitencia Creek Trail, the San Tomas Aquino Creek Trail, Ulistac Natural Area, and the Santa Teresa Park Historic Area. See other pages for more pictures on these areas. This list also includes OSA events at urban parks. The Open Space Authority partners with city agencies to provide educational and interpretive events in urban areas. My Bay Trail Pages - The Bay Trail, when completed, will be a 400-mile trail along the shores of San Francisco Bay. Here are pictures and descriptions of the southern Bay Trail segments from just north of SFO to Oakland Airport, many of which I submitted to the official Bay Trail Website. Note that the Bay Trail website has been revamped. The old photo tours are frozen and will not be updated until that process is complete, so they may have obsolete information, or they may not be available at all. The new tours are stored on my website. Spring Lake Regional Park, Santa Rosa - (May 2001) Guide to Spring Lake Regional Park in Santa Rosa and parks and attractions in Santa Rosa and Sonoma and Napa Counties. Edgewood County Park - Spring 2001 pictures of the trails and wildflowers at Edgewood County Park in Redwood City, one of the best places in the Bay Area for wildflower viewing. Arastradero Preserve - Pages on the 600-acre preserve in the foothills of the Santa Cruz Mountains above Palo Alto. Coyote Creek Trail North - The partially-completed Coyote Creek Trail from Yerba Buena Road to San Francisco Bay, and plans for future developments. Coyote Creek Trail Mileage Notes - Detailed mileage notes and pictures on the completed south parts of the Coyote Creek Trail. Ron Horii's Bay Area and Travel FAQS - (June 2001) Indexed archive of my replies to the Bay Area Backroads Message Board, with information on parks, travel, outdoor recreation, etc. and lots of links. Outdoor Photography and Internet Publishing - Text from presentation foils for a class I gave on this subject. Bay Area Outdoor Photography Gallery - Examples of some of my outdoor photographs, taken around the Bay Area. Outdoor Photography Class Powerpoint presentation (4/2007, 21 MB). HDR Experiments Part 1, Part 2, demonstration of High Dynamic Range photography. UCSB Summer - Pictures of my alma mater, UCSB, and of the beaches, parks, trails, and sights in the Santa Barbara area near the campus, taken in summer 2000. California College Tours - information, rankings, pictures, advice, and links on Calfornia 4-year colleges and planning college tours. Note that most of these Facebook albums are also listed above. This is a list of all the Facebook albums I have. They are organized by the date of the pictures, not by the date I created the album. Garden Boxes at the Bernal Ranch 1/5/18 (on STPFriends Facebook page). SJ Fire Dept. Training at the Pueblo Area, 1/19/18 (on STPFriends Facebook page). I often get requests to use pictures or information from my websites. Here are some examples. If you'd like to use something from my websites, send me a note. 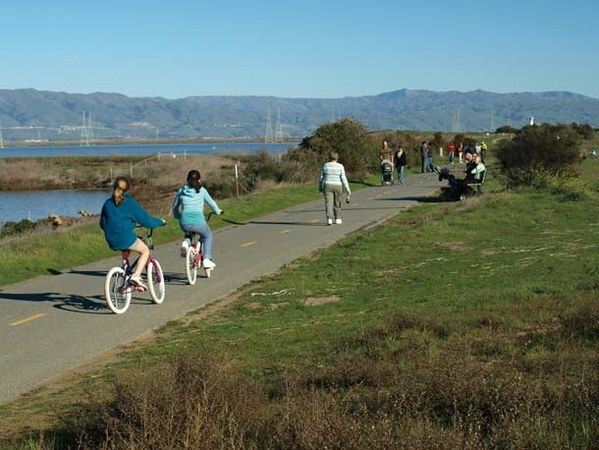 April-June 2009, picture of the Bay Trail in Mountain View's Shoreline Park: "A Bayshore Getaway in Silicon Valley." Pictures of the Guadalupe River Park and Gardens for a book on Hargreaves Associates by a professor at the Univ. of Penn. : Unearthed, The Landscapes of Harveaves Associates by Karen M'Closkey, University of Pennsylvania Press, 2013, page 124..
My picture of Rancho San Vicente was featured in the Peninsula Open Space Trust's 2009 Annual Report (print only). Many of my pictures were used on the Santa Clara County Parks Spring-Summer 2010 Play Here brochure, pages 1 top and bottom, 3 top, 4 bottom, 6 top, 7, 8, 9 (with me in it), 11, 12. Many of my pictures were used on the Santa Clara County Parks Fall-Winter 2010 Play Here brochure, pages 1 left and bottom, 2 top, 4 bottom, 5, 6, 7, 8, 9, 10 upper left, 11 upper left and center. Many of my pictures were used in the Santa Clara County Parks Healthy Trails 2nd Edition booklet, pages 26, 28, 29, 31, 32, 33, 39, 41, 43, 46, 48. Pictures of the group picnic sites in Hellyer County Park for the site reservation system. Many of my pictures were used in the County of Santa Clara Parkland Acquisition Plan 2011 Update. The Santa Clara County Parks Spring-Summer 2011 Play Here brochure has my picture of Coyote Peak on the front cover, Uvas Canyon on the back cover, page 2 top left, 5, 6 top left, 7 top right, 8 both, 11, 13 top left, 14 top right, 20 top right, 21 top left, 23 top left, 28 both (I'm in the picture on the left). My pictures of Calero and Rancho San Vicente were used in the Calero County Park Trails Master Plan open houses. Picture of Penitencia Creek Park in Metro Silicon Valley, May 11-17, page 70. District 2 newsletter for June 2011 has a picture on page 3 from the Norred Trail in Santa Teresa Park, showing the Albertson Parkway. The new County Parks Park Here Brochure released July 2011, has maps, pictures, and descriptions of all the County Parks. The cover picture is of the Norred Trail in Santa Teresa Park, taken by me on 5/27/10. I also took the pictures of Alviso Marina, Chesbro Reservoir, Chitactac-Adams Park, Uvas Reservoir, Rancho San Antonio Park, Sanborn Park, and Stevens Creek Park. The new County Parks Fall 2011-Spring 2012 Play Here brochure has my pictures on the front and back covers, top 3 on page 2, right 3 on page 5, top and bottom left on page 6, bottom left and top right on page 7, top center on page 8, upper left on page 12, all 3 on page 13. 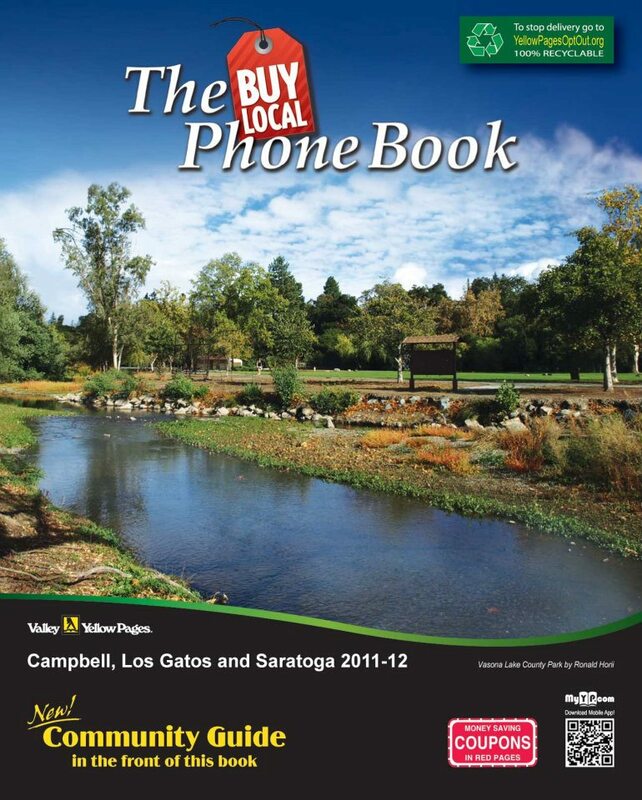 Picture of Los Gatos Creek in Vasona County Park on the cover of the Valley Yellow Pages directory for Campbell, Los Gatos, and Saratoga, September 2011, posted on Facebook. The Jan.-March 2012 Bay Nature magazine issue has a short article that I wrote on the Sunnyvale Baylands, with a picture of the Bay Trail. Many of my pictures were used in the Santa Clara County Parks Healthy Trails 3rd Edition booklet, pages 22, 25, 26, 28, 30, 36 (of me, not by me), 39, 41, 42, 50, 52. Pictures in the Calero County Park Trails Master Plan Alternatives Report. San Francisco Bay Shoreline Guide, Second Edition, A State Coastal Conservancy book, with assistance from the Bay Trail Project: Cover (top, Shoreline at Mountain View), pages 33 (Brisbane Pier), 37 (South San Francisco Bay Trail), 56 (Dumbarton Bridge Pathway), 59 (Palo Alto Baylands Nature Center and Boardwalk), 60 (Byxbee Park sculptures), 61 (Palo Alto Baylands boat ramp), 64 (Shoreline's sailing lake), 65 (Stevens Creek Trail over Caltrain tracks), 67 (Moffett Field Bay Trail), 69 (right 2, Alviso Marina County Park), 70 (top, bird-watching at Mallard Slough), 71 (top left, Coyote Creek Trail, bottom right, Drawbridge), 82 (top left, Eden Landing). Trail Rider Magazine, November/December 2012 issue, page 37, Alameda Creek Regional Trail. County of Santa Clara Parkland Acquisition Plan 2012 Update, December 2012 (many pictures). The Santa Clara County Parks Fall-Winter 2012-2013 Play Here brochure has my pictures on the cover, pages 1, 6, 7 left, 12, 14 left, 16 right center, 17 bottom left, 20 left, 21, 22 right, 23 right. I'm in 24 top and 27 top left. Transit & Trails website, County Parks Healthy Trails pictures: Joice/Norred Trails (Santa Teresa County Park), Los Gatos Creek Trail, Coyote Ridge/Savannah Trails (Coyote Lake County Park), Willow Springs Trail, Martin Murphy Trail, Mt. Madonna County Park, Coyote Creek Trail, Calero County Park, Deep Gulch/Mine Hill Trails, Hacienda Trail (Almaden Quicksilver County Park), Spring Valley Trail (Ed Levin County Park). The Santa Clara County Parks Spring-Summer 2013 Play Here brochure has my pictures on pages 5 top right, 6 top left, 7, 10 top right, 12 top left, 14 top left, 15 top right, 16, 17 top right, 18 top right, 19 top right, 21 top left, 22 top left, 24 top right, 25 top left, 26 top left, 28, 29. Many pictures in the Calero Trails Alternatives Report and the Calero Trails Draft Master Plan. 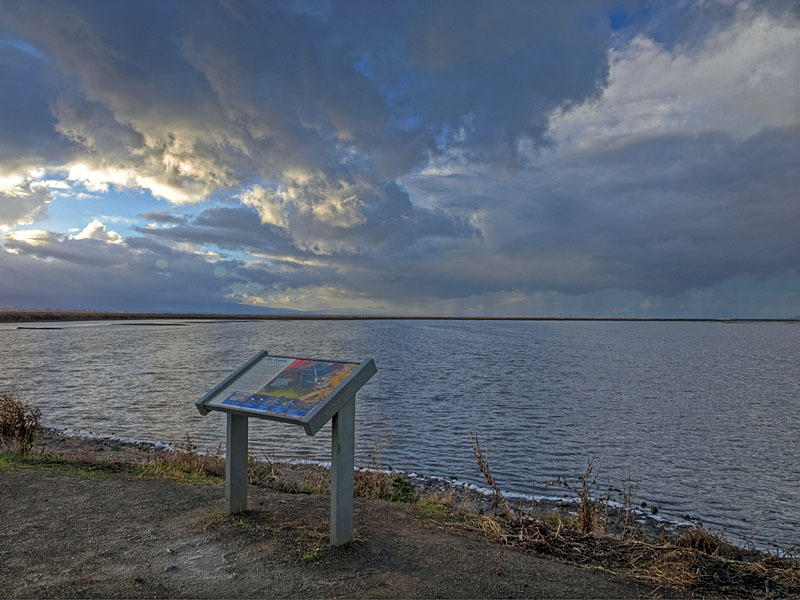 New Bay Trail maps: Moffett Bay Trail on the big map, Alviso Marina County Park on card 7. I worked on updating the website for the Friends of Los Alamitos Watershed (FOLAW) and included some of my pictures. The Active Times: Best City Bike Paths, #16: The Los Gatos Creek Trail. The Santa Clara County Parks Fall-Winter 2013-2014 Play Here brochure has many of my pictures. The October 2013 issue of M Magazine has my picture of Harvey Bear Ranch on p. 191. The Santa Clara Valley Water District's 2014 Stewardship Report Calendar has my picture of the Hacienda signs at Almaden Quicksilver for February. The Santa Clara County Parks Fall-Winter 2013-2014 Play Here brochure has many of my pictures, including the cover. Bay Area Parent, Silicon Valley Edition, August 2014, page 78. My Out & About Magazine, June/July 2014, pages 9 and 54. The latest (2014) County Parks Park Here! Guide has my pictures on pages 6-8 top and bottom, 9 top, 10-11 top and bottom, 13 top, 14 bottom, 15 top, 16 bottom, 17 bottom, 18 top and bottom, 19 top, 20 bottom, 21 top and bottom, 23. The August 2014 issue of My Out and About Magazine has my picture of a yurt at Mt. Madonna County Park on page 7. Bay Area Parent, Silicon Valley Edition, July 2014, pages 6 and 66. My Out & About Magazine, September 2014, my picture of Almaden Lake on p. 15. My son's picture of my photo class at Coyote Lake is on p. 14. His picture of Fandango is on page 62. Bay Nature Magazine, October-November 2014, page 38, picture of the Aquila Trail at Sierra Vista. Peninsula Open Space Trust's Fall 2014 Landscapes magazine, page 9. The Santa Clara County Parks Fall-Winter 2014 Play Here guidebook has many of my pictures inside. The October-November 2014 issue of South Bay Accent Magazine on p. 58 has my picture of Shoup Park in Los Altos. The November-December 2014 issue of My Out & About Magazine has an article that I wrote (pages 16-17) on taking photos to use for gifts and some good places to take pictures. My picture of the John Nicholas Trail in Sanborn County Park is on the front page of the Bay Area Ridge Trail Council's Spring/Summer 2015 Ridgelines newsletter. The Santa Clara County Parks Spring-Summer 2015 Play Here guidebook has my picture of the Stile Ranch Trail on the cover and many pictures I've taken inside. On page 20 is a selfie I took at Bull Run in Almaden Quicksilver. My pictures of Coyote Creek are on the walls of the Anderson Lake Visitor Center. A slideshow with my pictures of the County Parks is showing at the Hellyer Visitor Center. 7 of my pictures have been made into billboards for the County Parks' "Nature Is Nearby" campaign. My picture is on the cover the Santa Clara County Parks Annual Report 2014. Many of my pictures are inside. There is a picture of me teaching my photography class on page 8. My picture of Sierra Vista Open Space Preserve is on the Cover of the Bay Area Ridge Trail Council's 2014 Annual Report. The Santa Clara County Parks Fall-Winter 2015-2016 Play Here guidebook has many of my pictures. On page 18 is a picture of me teaching my outdoor photography at Santa Teresa Park. The County Park's 2015 Parklands Report uses many of my pictures. Some of my pictures of the Santa Clara County Parks were used in an episode of the "Open Road" TV show on NBC Bay Area. See the video on the Parks for Life Challenge, starting at 5:41 to 6:05. There is also a brief shot of me teaching my outdoor photography class at Santa Teresa Park at 2:08. The Santa Clara County Parks Spring-Summer 2016 Play Here guidebook has many of my pictures. There's a selfie of me on page 11. There was a TV commercial on the County Parks, airing on NBC Bay Area, narrated by Doug McConnell. It used pictures from the "Nature Is Nearby" billboard campaign. The "Yes on A" campaign to promote Measure A, the Parks Charter Fund renewal, has been using my pictures on their website, their Facebook page, and in ads and flyers. The measure passed by about 76%, so my pictures were successful. I was on an episode of "Open Road With Doug McConnell" on NBC Bay Area. They show my pictures of Rancho San Vicente (with Tom Cochrane), Alviso Marina (with Chris Carson), the John Nicholas Trail in Sanborn, and several pictures of Santa Teresa, Almaden Quicksilver, Coyote Ridge OSP, and Coyote Lake. 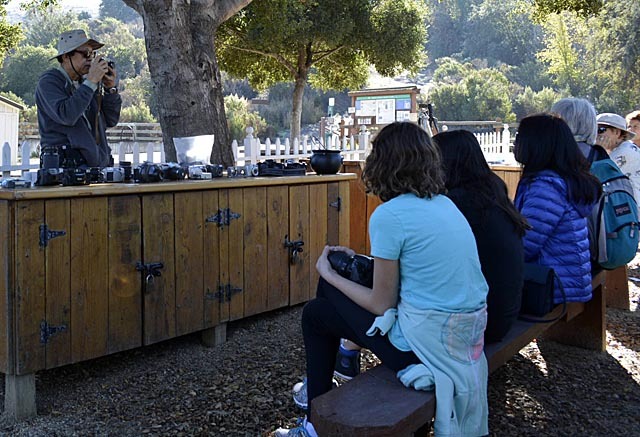 They also showed pictures of me teaching my photo classes at Santa Teresa and Coyote Lake, some of which were taken by my son Chris or by Mike Boulland. Here are the pictures they used. Doug McConnell interviewed me at Tilden Park because he was interviewing other people from Marin County and East Bay. They had me walk around the nature area of Tilden taking pictures. My picture of Sierra Vista Open Space Preserve was used as the cover picture in the Open Space Authority of Santa Clara Valley's 2016 report called, "Understanding Our Community: A Community Assessment Project." My picture of the Coyote Valley Open Preserve was used on the cover of the July 29-Aug 11, 2016 issue of the Almaden Times in an article on the Coyote Valley. They also used my picture of wildflowers on Coyote Ridge. The Santa Clara County Parks' Fall-Winter 2016 Play Here guidebook uses many of my pictures, page 2 for example. Poet Samanthi Fernando used my picture of the Hayward Shoreline for the cover of her book of poetry: Enchanted Bay Area: Nature Inspired Poetry. The Santa Clara County Parks' Spring-Summer 2017 Play Here guidebook uses many of my pictures. For example, all the pictures on page 33 are mine. The Santa Clara County Parks' "Wish you were here?" Ad Campaign used my pictures for billboards and panels on buses. My picture of the Alviso Marina was chosen for Save the Bay's 2018 calendar. The Santa Clara County Parks' Fall-Winter 2017 Play Here guidebook uses many of my pictures. My picture of Rancho San Vicente is on the front cover. Many internal Santa Clara County Parks publications. Many internal and external Open Space Authority of Santa Clara Valley publications. Their Spring 2017 newsletter has an article about me and uses serveral of my pictures. The Santa Clara County 2018 Strategic Plan document uses many of my pictures. Here is a list of them. My picture from the Bernal Hill Trail in Santa Teresa Park was used on the Gold Star Families Memorial monument at Oak Hill Memorial Park. Here are pictures of the dedication ceremony and the monument. The Santa Clara County Parks' Spring-Summer 2018 Play Here guidebook uses many of my pictures. Here is a list of my pictures. There's a picture of me teaching my photo class on page 21. The Santa Clara County Parks' Fall-Winter 2018-2019 Play Here guidebook uses many of my pictures. There's a picture of me (in green) leading my photo class on a hike in Coyote Lake on page 12 . Numerous requests from students and educators to use my pictures in their school projects. Santa Clara County Parks Volunteer Coordinating Council Award 2002. Volunteer Program Choice Award, SCC Parks & Recreation 2008. Volunteer Award, County of Santa Clara, California Park & Recreation Society, 2008. My picture of the Bernal-Gulnac-Joice Ranch won second place (see the last picture on this page), and my picture of Rancho San Vicente won third place (see this picture on this page) in the Historical Landscapes category of the city of San Jose's Historic Landmarks photo contest in 2010. Certificate of Commendation for 5,500 cumulative volunteer hours for the Santa Clara County Parks, 4/26/11 from Dave Cortese, Santa Clara County Supervisors. Docent of the Year Award, 4/24/12, Santa Clara County Parks & Recreation. I submitted 2 pictures to the 2014 San Jose Historical Photo Competition. They are numbers 11 and 15 on this page. My son Chris submitted picture #13. My picture of the Cottle House at Martial Cottle Park won best of show. Here is the picture and description. I also submitted a picture of Santa Teresa Spring. Here is the description. 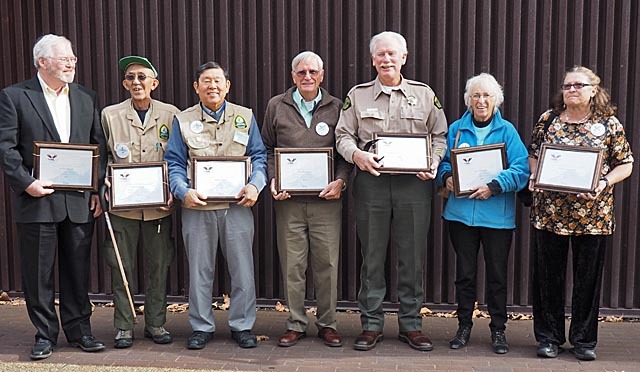 Recognition for 8,000 cumulative volunteer hours, Santa Clara County Parks, 8/9/14. 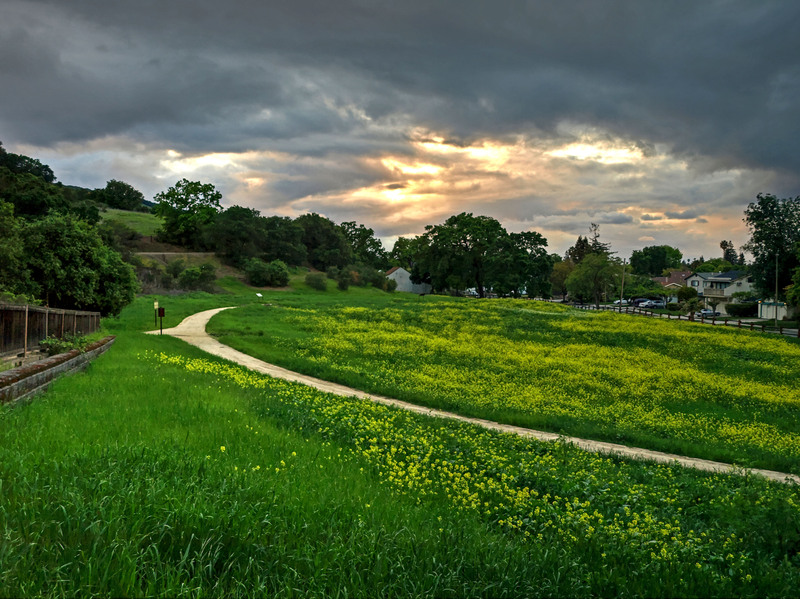 My picture of Vasona Lake County Park was one of three winners of Santa Clara County Supervisor Mike Wasserman's Summer 2014 Photo Contest. White House Lifetime Presidential Volunteer Service Award, presented by Santa Clara County Board of Supervisors, 11/18/14. My picture of the Casa Grande won first place in the non-professional category in the VisualSJ historic photo contest, with the award given at Southern Lumber on 6/16/15. 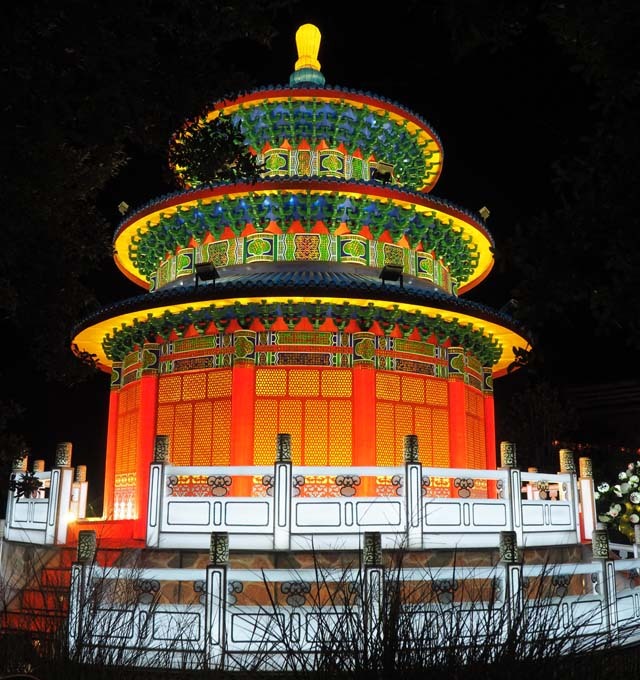 The award-winning pictures were published in issue 7.2 of Content Magazine, the Summer 2015 issue of PACSJ's Continuity magazine, and the June 19, 2015 issue of Almaden Resident newspaper. 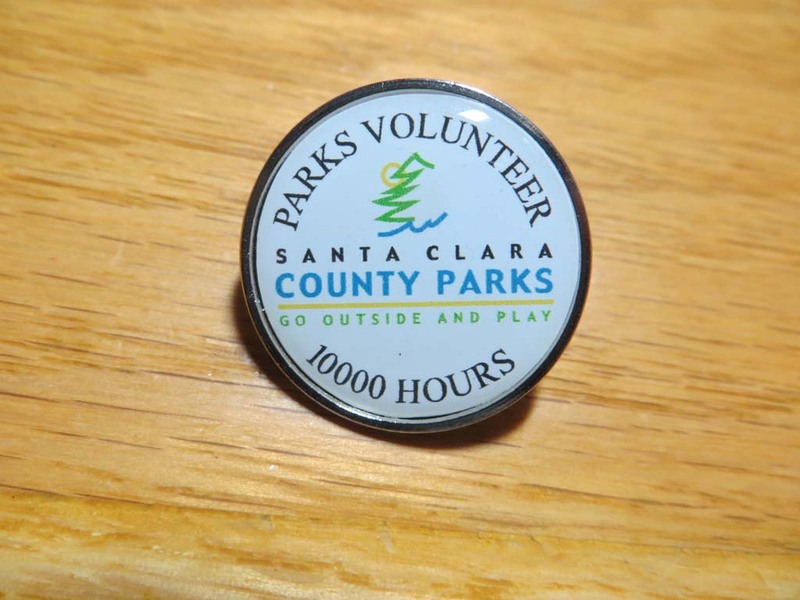 I was recognized for 8,500 cumulative volunteer hours at the Santa Clara County Parks Volunteers Recognition Barbecue at Santa Teresa Park on 10/17/15. My picture of Russian Ridge was a winner in the Committee for Green Foothills' 2015 photo contest. My picture of Sierra Vista Open Space Preserve was one of three winners of Santa Clara County Supervisor Mike Wasserman's Summer 2016 Photo Contest. I gave a slideshow and talk on nature photography to the West San Jose Kiwanis Club on August 17, 2016. They awarded me a certificate of appreciation with a clock. In 2016, I received a Certificate of Appreciation from the Santa Clara County Parks for 10,000 cumulative hours of service. I also received a pin for those hours. At the Santa Clara County Parks' 22nd Annual Volunteer Recognition Barbecue luncheon on 8/12/17, I was recognized for 10,000 hours of lifetime volunteer service hours. At the Santa Clara County Parks' 23rd Annual Volunteer Recognition Barbecue luncheon on 4/28/18, I was recognized for 11,000 hours of lifetime volunteer service hours. At the Santa Clara County Parks' 24th Annual Volunteer Recognition Barbecue luncheon on 4/6/18, I was recognized for 12,000 hours of lifetime volunteer service hours. Bay Area Backpages - Visit my first webpages on Prodigy, started in 1997, once featured on TV, on travel and outdoor activities in the Bay Area. It has pages on parks, hiking, camping, biking, beaches, swimming, museums, playgrounds, views, and information about places in the Bay Area and other parts of California. There's also a technical section on scanners. Prior to these webpages, I was a frequent contributor to Prodigy and other travel bulletin boards, and I found I was frequently answering the same questions over and over again. These pages gave me a means of having the information available permanently. Because of space limitations, I have not been able to expand these pages, so some have been supplanted with pages on this site. On June 1, 2011, AT&T terminated the Prodigy Personal Web Pages without warning (to me, at least). All my Bay Area Back Pages at http://pages.prodigy.net/rhorii are now dead. I may revive some of them here, but it will take time. Many of those pages are very old and are in need of upgrading. In the meantime, you can still find the home page on this archive. See here for the history of Prodigy. I attempted to re-create Bay Area Back Pages on this website, but not everything is working yet. Here are the major pages for my migrated Bay Area Back Pages. Note that many of these pages date from the 1990's, so they are not up-to-date. The links are most likely stale. Some things never change, so much of the fundamental information is still valid. Just don't expect the links to work. The information in these web pages was accurate to the best of my knowledge at the time the pages were written, but is not guaranteed to be accurate or current. Factors such accessibility, conditions, rules, ownership, directions, etc., can change without notice. Readers are responsible for finding out the latest conditions before venturing out. The information on these pages should not be treated as official, but as private opinions and observations. These pages are non-commercial and not officially associated with any company or agency. Links go dead faster than I can fix them. The older the web page, the more likely the links will be dead. All of these web pages are volunteer efforts, done in my spare time. I don't have time to constantly go back to check and refresh links on old web pages. However, if you are looking for some specific information, send me an e-mail, and I can see what I can do to answer your questions. Sorry. I don't have time, so please don't ask. I do not accept commercial link exchanges. Updated 4/23/19 by Ron Horii. E-mail me!